Tom Baker is the Doctor in Destination: Nerva. Throughout their existence, Big Finish has scored several major coups with regards to Doctor Who. The first in 1999 as the company picked up the license from the BBC to officially produce audio plays based on the franchise, with Peter Davison, Colin Baker, and Sylvester McCoy returning to the role of the Doctor in a series of continuing adventures. The second was in 2001, as Storm Warning saw the story of the Eighth Doctor, cut short after the events of the television movie, carry on, with Paul McGann carving out his own Who legacy over the years. And the third was in 2012, when after years of trying to convince him to come back to the role, the first Big Finish audio starring Tom Baker as the Fourth Doctor was released. Baker, who still stands for many as THE iconic portrayal of the Doctor, had been approached many times by Big Finish throughout the years to play the Doctor once again. However, according to Baker, none of the scripts that were submitted to him caught his interest, and he turned down the offer time and time again. It wasn’t until 2009 when Baker agreed to do a series of audio plays for the BBC alongside Richard Franklin reprising his role as Captain Mike Yates of UNIT. 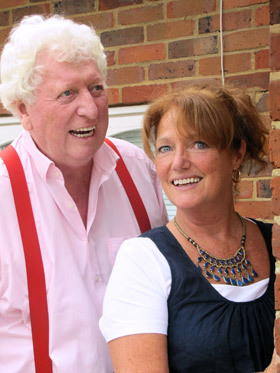 Perhaps it was the feeling of playing the Doctor once again that convinced Tom Baker to accept Big Finish’s offer after nearly a decade, as it was announced in March 2011 that Baker would be starring in six audio adventures in his most famous role, alongside Louise Jameson who played his companion, the savage noble Leela of the Sevateem. Fans eagerly awaited the publication of the first audio. While David Tennant and Matt Smith have become the representations of the Doctor in current pop culture, for many people around the world, Tom Baker’s portrayal of the wide eyed Bohemian with a floppy hat, long scarf, and huge grin was and always will be THE quintessential portrayal of the Doctor. After saying goodbye to Professor Litefoot and Henry Jago, the Doctor and Leela find themselves drawn to a manor house in Victorian England. This time, it’s a distress signal that grabs the Doctor’s attention, causing the TARDIS to materialize in the aftermath of a pitched battle between British soldiers and a group of aliens. As the dying words of one of the creatures warn the pair that the spaceship must not escape, the activation of that ship’s hyperdrive causes an explosion that the Doctor and Leela barely escape, making it to the safety of the TARDIS just in time for the temporal exhaust from the ship’s engines to knock them from 19th century England all the way to the 29th century. The TARDIS manages to land in a setting familiar to the Doctor; Nerva, a space station orbiting the Earth. It is here, in the Doctor’s past and the station’s future, that the Doctor will encounter both the Wirrn and the Cybermen. But today, as the station nears completion and the systems are constantly on the fritz, there’s another visitor due to dock with Nerva, one that is very much homesick and looking forward to contributing to the evolution of humanity…and humanity has little choice in the matter! The Nerva Beacon is a setting familiar to fans of the classic series. It served as the backdrop to the beloved serial The Ark in Space and for the “let’s recycle an existing set and save on the budget” serial Revenge of the Cybermen. Both serials featured the Fourth Doctor, so picking Nerva for his first Big Finish serial seems to be an action on the part of writer/director Nicholas Briggs to add a sense of familiarity to the proceedings. The first episode kicks off moments after the conclusion of the television serial The Talons of Weng-Chiang, as Leela asks if they will ever see Jago and Litefoot again (spoiler alert – Leela will, as the pair have their own successful Big Finish audio line). The Doctor even makes reference to the box of Lucifers (matches) that Litefoot gave him during the second episode. With such literary devices, Destination: Nerva is firmly placed into the Doctor Who timeline. One has to wonder if by utilizing such devices, Briggs was attempting to make those newcomers to Big Finish who were lured in by the premise of “their Doctor” returning to the role feel comfortable and at ease, picking up where what some consider the best Fourth Doctor serial left off. Doing so, however, might lend confusion to those Big Finish listeners for who Tom Baker isn’t “their Doctor.” It’s a bit of a shock, but there are some out there who haven’t seen The Talons of Weng-Chiang, or even know who Leela is/was. For the Big Finish debuts of the other Doctors, Big Finish didn’t lean on continuity or make references to previous adventures. Those stories (Phantasmagoria, Whispers of Terror, the Fearmonger, and Storm Warning for those keeping track) involved characters from the classic series in three out of the four cases, but were set up as individual stand-alone tales. 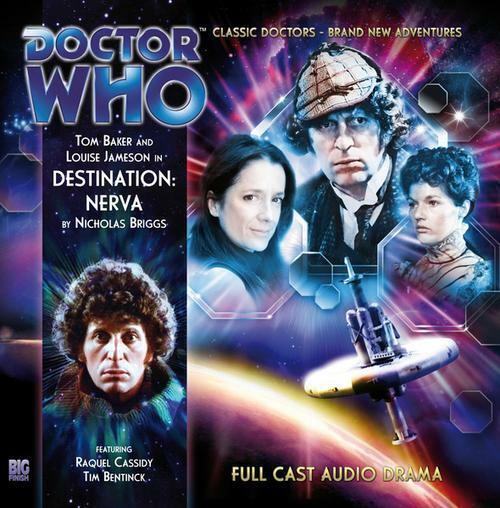 Destination: Nerva does stand alone and can be listened to without knowing anything other than “there’s an alien called the Doctor who travels and universe and fights evil,” but the choice of setting the story on Nerva just seems unnecessary and, in something Big Finish rarely does, thrown in solely for the sake of “hey, look, you know this place!” Then again, it could just be a nod to the recycling of the set for Revenge of the Cybermen, but the rest of the script doesn’t show enough of a clever streak to support that fact. The action doesn’t quite flow and scenes don’t transition as well as they should, and while the alien threat is well documented, there’s just no sense of urgency to the proceedings. The reasoning behind the alien threat and the “cure” for it is actually pretty well thought out, but that’s the extent of the script’s intelligence. The whole thing comes off as very “paint-by-numbers,” an attempt to mimic that period of the show without putting any heart, soul, or effort into the proceedings. On the other side of the coin, Leela is played in grand fashion by Ms. Louise Jameson. Jameson has had the advantage of playing Leela in some previous Big Finish productions, including the highly regarded Gallifrey series and guest spots in several Jago and Litefoot audios. I admit I was a bit leery about the “noble savage” being picked as a companion, if only because of how Leela was written during her time on television; sometimes as a brilliant fish-out-of-water, and sometimes as a dumb, bloodthirsty cavewoman (as she was in Zagreus ). Briggs does her justice in this production, though, writing her as curious, inquisitive, and tough, all the while respecting the Doctor as both a “man of wisdom” and a man “touched in the head.” Jameson lives up to the writing, showing off her primal instincts of “stab first, ask the Doctor for permission later” but also backing down when he asks, not out of fear or anger towards him, but out of respect. Baker and Jameson didn’t have quite the magic that Baker and Elisabeth Sladen did during their time on television, but even with Baker’s bored performance, the seeds are laid for some great chemistry that shines through in future audios. The supporting cast is nothing to write home about. The performances are, at best, adequate, with no one really standing out from the crowd. You have your mustache twirling British imperialist in Tim Treloar and Nerva’s overworked and overstressed medical officer played by Raquel Cassidy. Everyone else is interchangeable. I honestly, a few hours after finishing this play, tell you anything special about the communications officer, the commanding officer, or the head worker who wants to take his workers on strike due to poor conditions. Cassidy’s big dramatic scene comes off as very flat, like she’s reading right from the script, and the situation she calls on, the memory of her daughter, is a very weakly fired Chekov’s Gun. The hour format does mean that the character development found in the two-hour audios from the monthly range is lost, but future audios in the Fourth Doctor Adventures line do a much better job of building up the importance of the supporting characters. If there’s one thing that always comes through for Big Finish, it’s the sound department. The Talons of Weng-Chiang was Phillip Hinchcliffe’s last’s serial as producer for Doctor Who, but the spirit of Hinchcliffe, whose time on the show consisted mainly of making legions of British children hide behind the couch, is alive in this episode, as it contains some of the most horrifying sounding body horror I’ve ever heard. The alien menace takes over their victim’s body and performs a complete genetic re-write, and Jamie Robertson milks it for all it’s worth. It’s long, it’s gruesome, and the victim is aware of it the entire time. While the rest of the sound work is top notch as well, it’s the transformations that stick with the listener long after the conclusion of the story. And that’s all that will remain with the listener, as the rest of the tale is utterly forgettable. It’s a poor start to Tom Baker’s time with Big Finish, but luckily, the pace picks up with the next story. Synopsis – Destination: Nerva is the return of Tom Baker to the role of the Doctor, but even in a familiar setting, the weak script and forgettable performances make this a lackluster season premiere. 2/5. Tom Baker is the Doctor in…The Renaissance Man. This entry was posted in Big Finish Review and tagged 2/5, Big Finish, Doctor Who, Fourth Doctor, Leela, Louise Jameson, TARDIS, Tom Baker. Bookmark the permalink.